Information and Communication Technology (ICT) has been a driving force for economic and social development, and continue to spur the globalization process. However, benefits of ICT have spread unequally, especially between the disabled and the non-disabled. ?Visual impaired persons (VIPs) in developing countries of the Asia-Pacific region have also been continuously left behind in the development of ICT. ICT can be one of the best solutions to empower VIPs if they are able to utilize such technologies. The majority of VIPs lack opportunities to learn about ICT. In this regard, YPSA and Sightsavers International (SSI) & University of Dhaka are organizing ICT Training for VIPs to make them confident on ICT. So they can enjoy the benefit of ICT. VIPs to train computer Screen readers, speech synthesizers, self-voicing software, Using Microsoft Word with JAWS, Using Excel with JAWS, Using PowerPoint with JAWS, Using DAISY Talking Book, Electronic Books, Information Accessibility for PWD, Policy and Legislations regarding ICT. 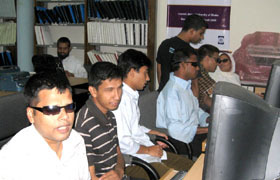 Thirty-Six visually challenged students attend in the training. Training will be conducted by three batches. Each group 12 students take part in the training. It is expected, through this training Visually Challenged student will be enlightened on knowledge of ICT.